Long and healthy hair is a wish for every girl. Growing your hair long and healthy is a task which takes a lot of time and required so much amount of patience. Growing your hair with growth stimulating ingredients makes the task easy in the busy life. For this, we have our star ingredient that is onion. Try this DIY of Onion juice for hair growth and you will see the results soon. First, let see its benefits. It is a known remedy for hair health, especially for hair fall. Onion juice helps to relieve the inflamed, dry and itchy scalp. It is very beneficial in hair loss problem. Onion juice treats the problem of dandruff. It helps to grow hair fast and thick. It also prevents premature greying of hair. Here are 12 simple and easy home remedies of onion juice for hair growth. Dip a cotton ball in onion juice. After applying the juice with the help of cotton ball massage it into the scalp with your fingertips. Then wash it off with a mild shampoo. 2 tbsp of Coconut oil – Coconut oil makes the hair soft and gives the moisturizer to the dry and flaky scalp. Mix coconut oil and onion juice in a bowl. Massage this mixture onto your scalp and hair. Leave it for 2 to 3 hours and wash it off with mild shampoo and conditioner. You can follow this remedy on every alternate day. 2-3 tbsp of Olive Oil – Olive oil polishes your hair and makes them smooth, silky and shiny. Mix olive oil and onion juice in a bowl. 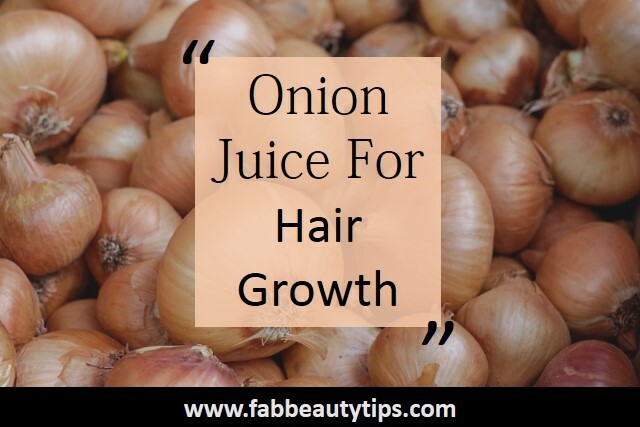 This is one of easy an effective way to use onion juice for hair growth. One whole Egg – The high protein content of eggs helps to nourish your hair and keep it healthy while the onion juice stimulates the scalp to promote hair growth. Whisk egg and onion juice nicely (You can also add some essential oils to it like rosemary and lavender essential oil). Apply this to your scalp and hair for about 20-30 minutes, covered by a shower cap. Wash it off with mild shampoo and conditioner. You can apply this 1 to 2 times a week. Mix both things really well in a bowl. Apply this to your scalp and hair for about 25-30 minutes, covered by a shower cap. You can apply this mask 2 to 3 times a week. 2 tbsp of potato juice – Potato is an abundant source of nutrients such as vitamin B and C.
Apply this to your scalp and hair for about 30 minutes, covered by a shower cap. This is one of the best ways to use onion juice for hair growth. 1-1.5 cup of henna powder – Heena powder has so many benefits to the hair. It improves the growth of hair, reduces the hair fall, it prevents dandruff and control scalp itchiness. Mix henna powder and onion juice together in a bowl. Slowly add water and mix it till you get a nice thick paste-like consistency. Apply it on hair for 2 hours least. 1 tbsp of apple cider vinegar – Apple cider vinegar is a great ingredient which solves so many problems at once. Apple cider vinegar has so many benefits of balancing the ph level of hair and scalp, treats dandruff, dry and itchy scalp, it’s a natural hair detangler. This is one of the best ways to use onion juice for hair growth. Apply this on your scalp with the help of cotton ball and keep it for 1 hour. 1 tbsp of castor oil – Castor oil has natural antibacterial and antifungal properties and is high in vitamin E, minerals, protein and omega 6 and 9. It promotes hair growth and make the hair strong. Apply this on your scalp and hair and leave this for 1 hour. ½ tbsp of honey – Honey cut the chance of breakage of hair. It moisturizes the skin and scalp and also strengthens the roots. It has antioxidants properties which makes it suitable for all hair type. 2 tbsp onion juice. This is one of the best ways to use onion juice for hair growth. Mix them together to make a smooth paste in a bowl. Apply this on your scalp and massage in circular motion. Keep it on for 30 minutes and wash it off with mild shampoo and conditioner. 2 tbsp of Amla powder – Amla is also known as Indian gooseberry. Amla strengthens the hair follicles because of its fatty acids. The surplus of vitamin C is helpful to cut the premature hair graying. It also promotes hair growth and makes them soft and shiny. Mix all above-mentioned ingredients really well in a bowl till you get nice paste kinda consistency. Apply it to scalp and hair and keep this for 1 hour and wash it off with shampoo. Onion hair rinse is the easiest way to grow hair fast and healthy. Onion juice for hair growth is one of the fast ways that helps to grow hair by providing them the nutrients they need to grow. In a pan take 1-liter water and add onions and boil them until the water goes half of it. Make cool on the room temperature. After washing your hair rinse your hair with this solution. Do this on alternate days. These are some really easy but effective ways you can use onion juice for hair growth which you can make at your home without spending much money. Try these and see the difference in your hairs. What an amazing post babe. Can be easily tried out at home 😍 I am planning to go with onion juice plus coconut oil..
Onion juice is great but just scared about the smell. Probably will mix it with oil. Onion is a magic ingredient in hair care,but less raved about. Thank you for sharing so many onion hair care recipes, I’m bookmarking this post right away! I was really looking forward to this. Gonna share this with my roommates as well. That’s a neat compilation of all recipes in one place. So I have the options of 1,2 , 9,10 which I can try and then chose the best Onion oil combo for my hair. This was really informative for hair health. My mom always used to tell me about onion juice and its benefits of hair. It is effective and safe to use than the chemical products available in the market. I myself have tried it and yes, it works. Totally agree with you. Onion juice is the magic potion for hair. It promotes hair growth in a good extend. These are some helpful tips I will surely try few if them..
Wow. This is like baap of all the home remedies. Onion is the most effective ingredient when it comes to reverse hair loss. Thanks for all the details. It’s an amazing post dear. Will try them all. Onion juice seems a magical potion to me. Thank you for sharing so many benefits and ways to use it. Would try it for my hairfall and treating dandruff. Onion juice has awesome benefits for hair.. I am going to try olive oil and onion juice this weekend..